playing in the mud, originally uploaded by AmyEmilia. 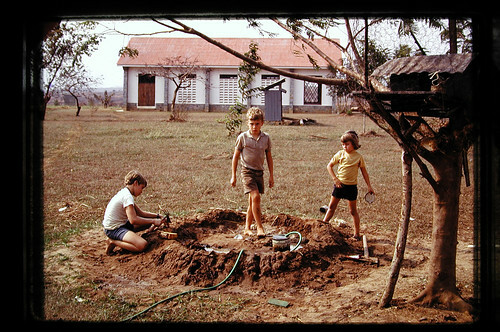 Entertainment at Kivuvu was generally self-created. There was no TV, no radio, no telephone. No electricity during daylight hours. One favorite pastime was playing with the water hose. Looks like my brothers and sister made a cool little construction here! Since the surrounding landscape looks rather brown, I conclude that this was the dry season, and probably not the best use of our somewhat limited water. Behind my brother is a young tree, one of several chaulmoogra trees that my father planted. I believe he brought the seeds from India. Chaulmoogra oil was one of the pre-sulfone treatments for leprosy, and Dad wanted to test the idea out again. I wonder if they are still growing? In the foreground is a flamboyant tree which was partially caged with chicken wire, and served as a home for one of our pet vervet monkeys. The building in the background is the small church we had at Kivuvu. A simple building of concrete block, corrugated roofing, and breeze-block walls. There is also a small grey construction in between that looks like an outhouse but in fact was the night watchman's station. We always had a night watchman or sentry while we lived there. I can remember watching him walk by the house swinging his kerosene lantern and singing softly. Always made me feel a little safer!